I just love soups during the fall and winter. There are so many options and they warm you to the core. I could eat just soup for dinner and be fine, but Matt needs a little something more to make it feel like a meal. That is why I whipped up some skillet cornbread to go with our ham and bean soup. Of course you could make it with yellow cornmeal, but I happened to have blue and thought that would be a fun change. Matt always appreciates when things are a little different than normal. It makes the meal feel a little more special. Of course Jax promptly broke up his piece and put it all in his soup. He loves stirring things up and the more things he can fit in his soup bowl the better! Matt liked the cornbread so much that he cut a slice off for a friend who visited later. He wanted to show off our blue cornbread, so he warmed it up and served it with honey and butter. It got rave reviews all the way around! This cornbread is not super sweet, I wanted it to be able to stir it into my soup like Jax without making the soup too sweet. You could easily up the sugar to 1/2 cup if you want a sweeter cornbread. Making sure everyone is happy with dinner is hard work ;-) I thought the blue cornmeal made it a little more fun! 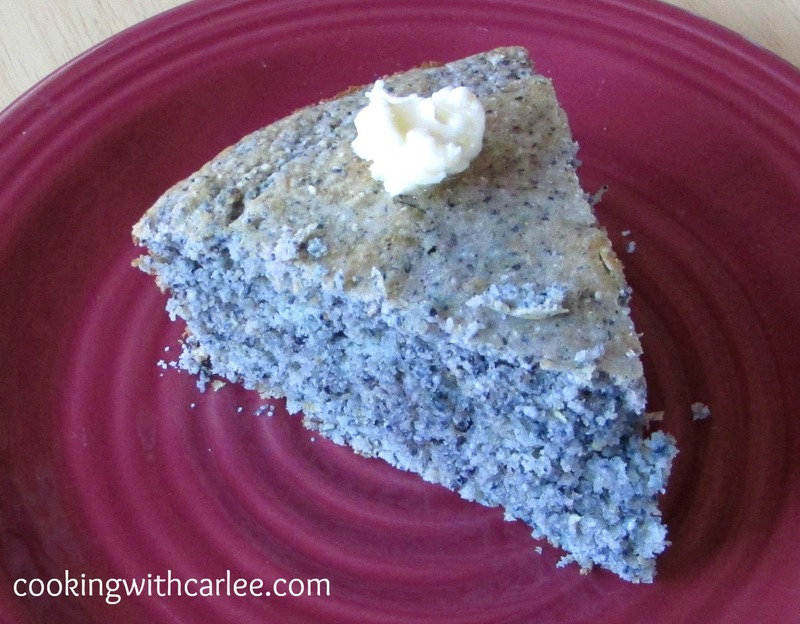 I love making cornbread like this Carlee but have never used blue cornmeal! It makes such an impressive dish! It does make it stand out a bit more. My husband was shocked when he saw it! I love cornbread. 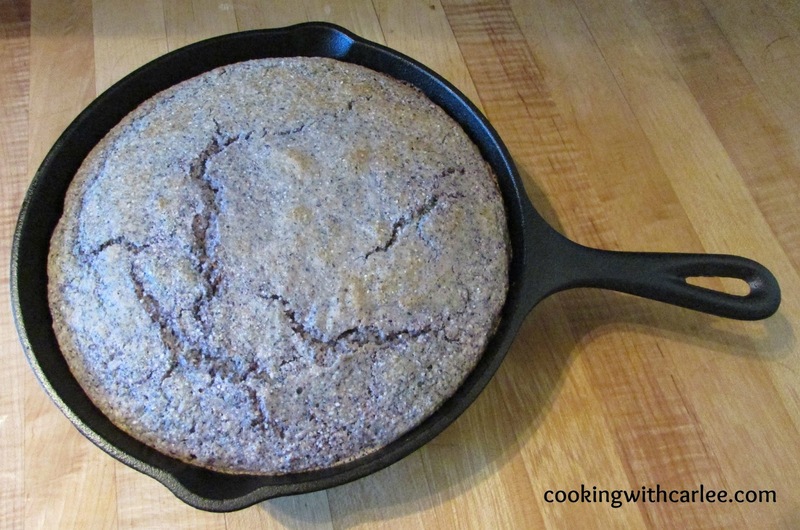 Love that you made it with blue corn meal. Where in the world do I find that?? Because now I'm going to have to make it with the soup! Mine was from Bob's Red Mill. Of course the blue is totally not required, but it is fun! 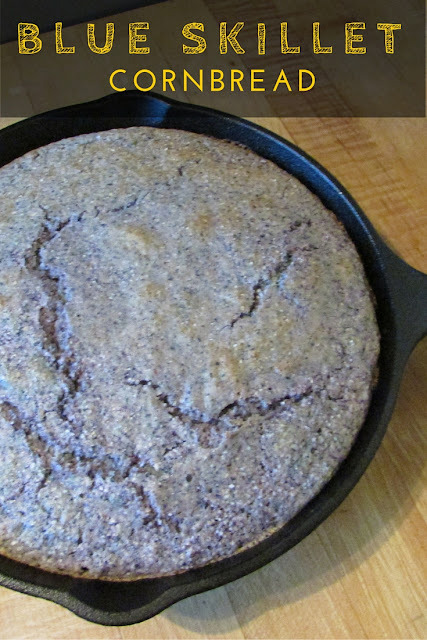 I have to say I have never seen blue corn bread before. Pretty cool. Thank you for sharing your recipe with us at Snickerdoodle Sunday! Pinning! It is such an easy way to switch up an old favorite recipe and make it fresh and fun! Thanks for stopping by! I like that idea of blue cornmeal! Thanks for sharing on What's for Dinner? Sunday link up! I just LOVE cornbread, so I'm sure this is completely amazing! YUM! I also love the blue color to it! I thought the blue cornmeal made it a little more fun! Thanks for hosting! Looks Yummy! Does blue corn taste different then yellow? Thanks for sharing on My 2 Favorite things on Thursday!! Hope to see you again this week! Pinned! It tastes very much the same, I just thought it would be a fun look since I happened to have some blue cornmeal on hand! Just love this especially accompanied by soup but on its own would be just fine too. Thanks for linking up to #SaucySaturdays. Honey and butter is a perfect accompaniment if you run out of soup! Thanks for hosting! I've only tried cornbread in the US when I visited and haven't seen blue before! Thanks for sharing with us at #WednesdaysWisdom it is always a pleasure to have you join us Carlee. It tastes exactly like the yellow version, but the blue cornmeal makes it so pretty. Thanks for hosting! I never heard of blue corn bread before Carlee! I bet it is delicious. I think it is a pretty twist! Thanks so much for hosting! Thanks Heather, I thought the blue really gave it some pizzazz!